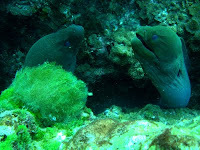 We are holidaying in Koh Lanta at the moment and today we went out on our first day of diving on the trip. As we have for the past 5 years we were diving with Blue Planet and were happy when Laurent said we were going to the main dive sites in this area - Hin Muang and Hin Daeng, but weren't too pleased when he said it was a 6.45am meet - meaning getting up at 5.45 to walk the dogs. Not even they were to happy to be walking at that time - they are on holiday after all as well!! The boat left at 7am and most people had a sleep on the way. We got to Hin Maung first after the 4 hour boat journey - it's a long way and not by speedboat!! 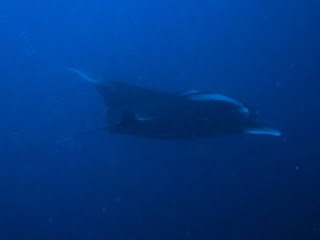 Viz was only about 7-10 metres, but with lots of fish and the possibility of a Manta that was enough. 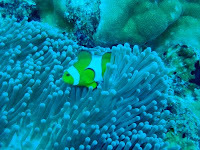 It was just nice to be diving somewhere different and to see different fish to usual. The first dive was good but pretty uneventful with the rumour of somebody seeing a Manta but nothing confirmed. Then after a quick hour on the surface we dropped down at Hin Daeng, with a message from another boat saying there were two Mantas around. Again viz was only about 7-10 metres, but again with lots of fish and lots of colour the viz was enough. 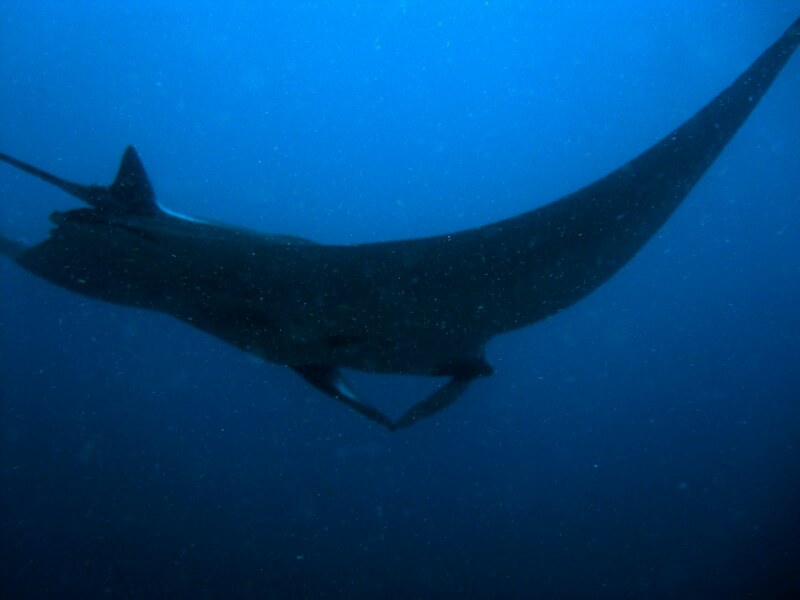 After swimming around for about 10-15 minutes and frantically looking for the Manta's, I caught a very quick glimpse of a big dark object swimming away. 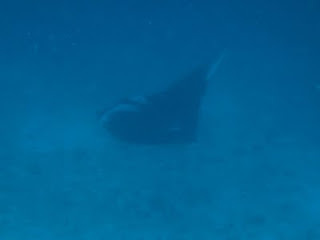 Knowing there was a Manta around we stayed put for a couple of minutes before seeing a 4 metre Manta swimming quickly below us at about 30 metres. I managed to get a quick shot but not a brilliant one. 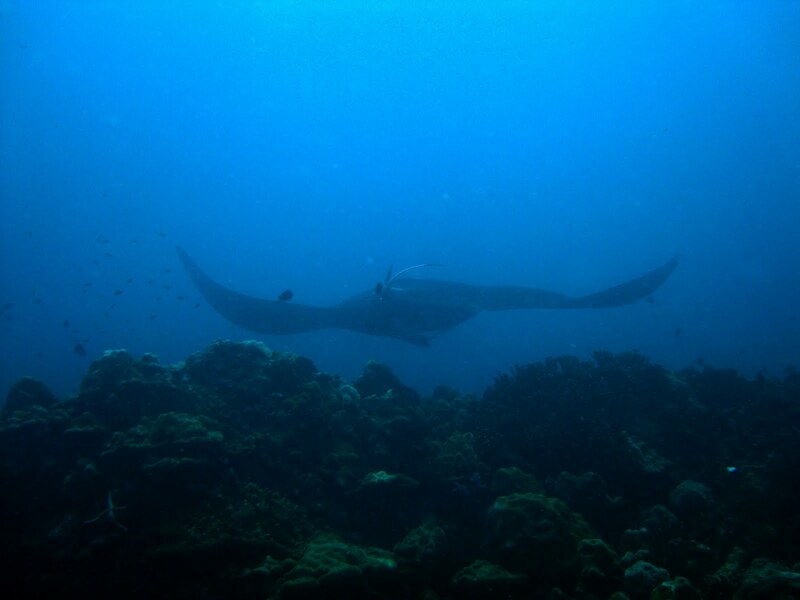 Knowing the Manta's were in this area most of the dive groups stayed around, and watching one group start swimming and pointing at the same time I guessed they had seen one. And sure enough there was a big Manta Ray about 6 metres tip to tip, just disappearing over a ridge. We managed to get within a couple of metres of it before it turned and quickly disappeared. Again I managed to get a few photos but none that are likely to win any awards!! But to be honest I'm not too bothered about the photos, seeing Manta Ray's again made it worth while getting out of bed while it was still dark!! Having been away for all of this year, it's great to see that the sharks are now back at Chumporn Pinnacle. 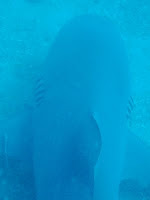 We don't know where they have been but general opinion is that the sharks are now alot bigger than they were before, particularly one very large bad boy Bull Shark at around 3 metres long!! Previously at Chumporn Pinnacle most of the reef sharks would be 1.5 - 2 metres, with the occasional one a little bit bigger. 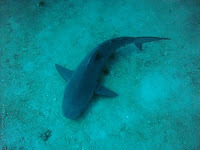 When we dived there recently it seemed that even the smaller of the sharks were around 2 metres. Let's hope they stay around for a while!! 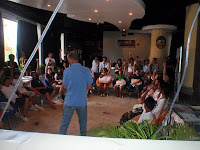 Staff from Divers in Paradise, The Dive Academy and Planet Scuba hosted children from Bluewaterer School as part of the Samui Mala 2009. The children listened to presentations on Oceans in Trouble, which addressed the problems caused by trash in the Ocean, and Protect the Sharks, which looked at the role Sharks play in the underwater world and how they are in danger due to overfishing and shark finning. 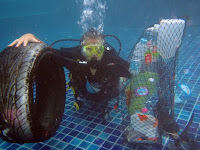 The children then took to the pool where they were introduced to diving and were shown examples of the kind of trash that we regularly see underwater. The boys and girls from Bluewater were a pleasure to meet and hopefully they learned something new and enjoyed what we had to show them. One special comment from one of the children at the end of the afternoon after watching Sharkwater, the film showing exactly what happens to sharks to satisfy the Shark finning trade: "We've got to do something about this!!" - let's hope they do. Great job guys to all those that made the event a success. 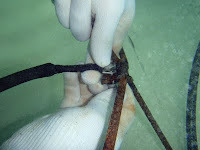 We are pleased to say that the Seahorses that have been resident in Mango Bay for the past month or so are still alive and kicking. There were reports that one of them was seen floating lifeless, but we managed to find both the small one (max 5cm) and the larger one (approx 10cm)(pictured here). 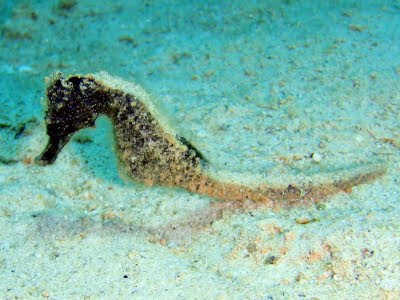 A bit of info on Seahorses: Seahorses are actually fish (not horses) and are part of the same family as Pipefishes. 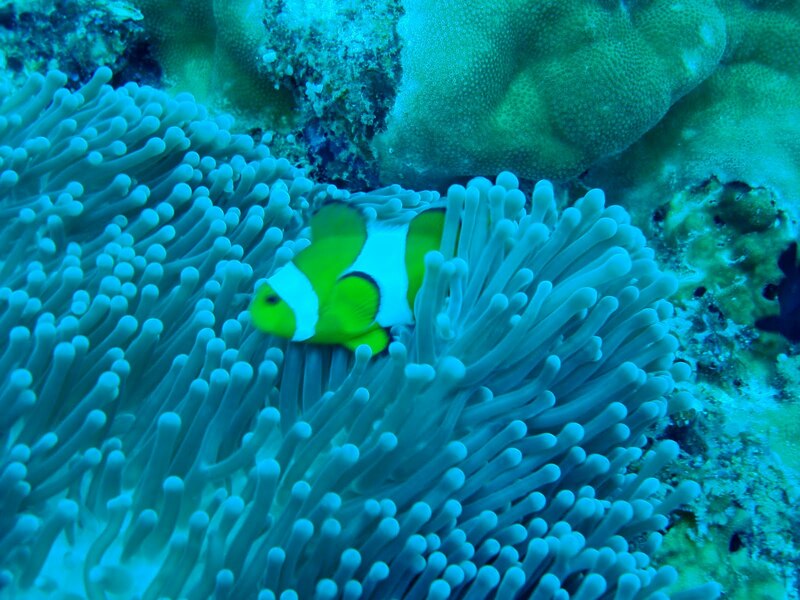 They use camouflage to blend in with their surroundings, which is why they are so difficult to find in Mango Bay. They can change coulour to match the coral or whatever is around them. They usually feed on small crustaceans such as shrimps, which they hoover up using their long snouts. The Dive Academy have just bought 3 new DPV's (Underwater Scooters). 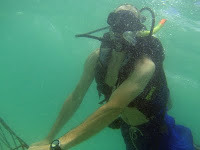 The scooters can be used on one of the Adventure Dives for the Advanced Open Water Course or even just to have a bit of fun on a dive tour. And if you really enjoy yourself playing at being James Bond and want to know more, we can do the DPV Specialty Course with you. Sarah came back from her morning walk with the dogs today with more than when she started. Being the morning after full moon, and the party, there was a load of rubbish and debris of all sorts on the beach, ranging from lost flip flops, bottles of wine (empty before she got to it), plastic bottles and the usual fishing net - basically a black rubbish bag full. 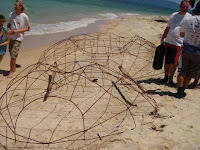 There was also a live puffer fish, stranded on its back, panting for breathe on the beach. 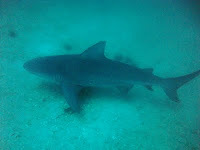 Sarah managed to get it back into the sea where it swam off to pose somewhere for photos for us divers!! 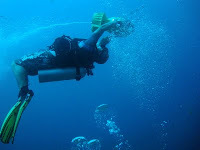 After being a diver for the past 6 years now, my dad has just recently completed his 100th dive. 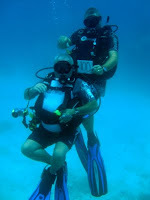 It turned out that I was able to join him for the dive which made it special. We dived at Twins in Koh Tao, and although we have both dived there a few times before, we had a great dive and saw some great things, including an unusual nudibranch and a fantastic flatworm. Here's to the next 100, although I think 100 years will come before the next 100 dives!! 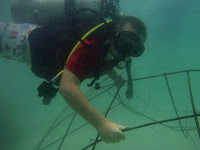 This is the first of many blog posts from The Dive Academy. 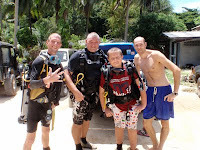 For those of you who don't know who we are we are a PADI 5 Star Diving Centre based in Koh Samui, Thailand.